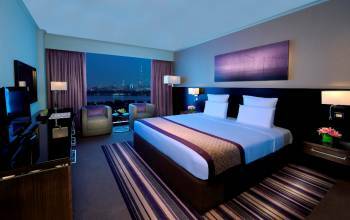 Modern sophistication awaits 10 minutes away from Dubai International Airport at the Pullman Dubai Creek City Centre hotel. 317 elegantly appointed rooms provide relaxation and entertainment with free WiFi and a wide-screen LCD satellite TV. Order room service around the clock, or treat yourself to an interactive dining experience at the inviting Medley restaurant. The blue mosaic-tiled swimming pool and Azure rooftop bar are perfect spots to lounge facing stunning views of Old Dubai’s skyline.